The American oil industry may be on the cusp of an incredible revival. Following a painful war with OPEC, U.S. oil output is poised to rebound this year, thanks to healthier prices and a strengthened business model. 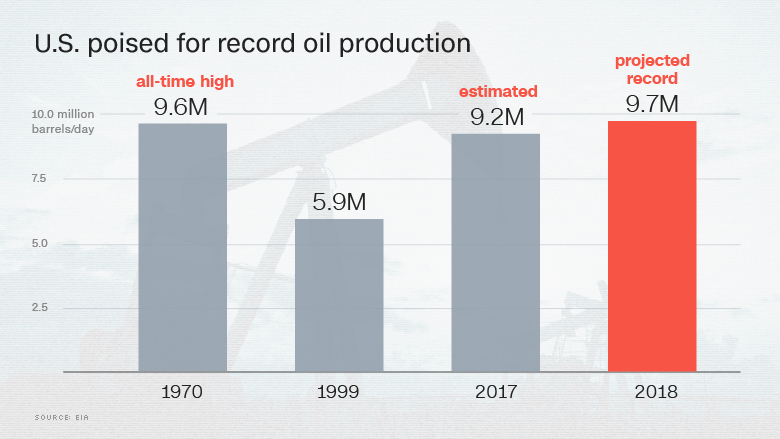 That could set the stage for America to set a record-breaking 2018, taking out the all-time oil production high set in 1970, according to new forecasts published this week by the U.S. Energy Information Administration. The U.S. oil comeback is being led by the Permian Basin, a hotbed of shale drilling in Texas and New Mexico. The Permian is so rich in shale oil that frackers can profitably drill even in today's modest prices in the low $50-a-barrel range. "Shale has proven to be remarkably resilient. The key is that any dollar invested today is double as efficient as it was two years ago," said Tamar Essner, energy director of Nasdaq Advisory Services. The optimism stands in stark contrast with the fears that rippled through the U.S. oil industry in late 2014. Back then, OPEC decided to keep pumping all-out despite the supply glut created in part by the U.S. oil boom that sent oil prices spiraling lower. OPEC's strategy appeared aimed at drowning American frackers by dropping prices far too low for them to survive on. Many worried about a steep decline in U.S. output. OPEC's price war did spark a wave of bankruptcies, painful job cuts and a dip in U.S. oil production as crude plummeted to as low as $26 a barrel. Domestic output peaked at an impressive 9.6 million barrels per day in April 2015. But the oil boom didn't collapse completely. U.S. oil output fell only a little, bottoming out at 8.7 million barrels in July 2016 and has since stabilized. 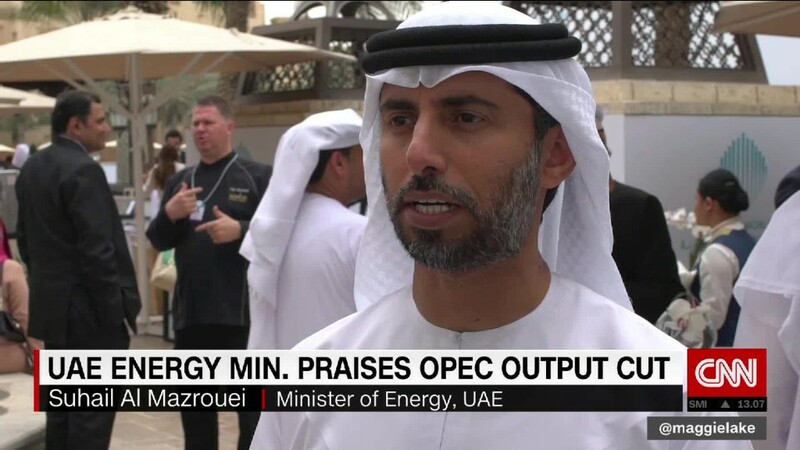 Drilling has gathered steam in recent months as oil prices rebounded after OPEC abandoned its previous strategy by agreeing to cut production along with non-OPEC nations like Russia. Now, the EIA has significantly ramped up its U.S. forecasts, predicting daily domestic output of 9.2 million barrels for this year and then 9.7 million barrels in 2018. That's up dramatically from a previous estimate in November for 2018 production to rise to 8.9 million barrels. All eyes are on the frenzy of shale activity in the Permian region. Frackers have scrambled to add rigs in the Permian. The rig count has nearly tripled from a low of 132 last April to 308 now. "We believe shale production is set to reestablish itself for growth" that could be "fairly dramatic," said Anthony Starkey, energy analysis manager at Bentek Energy, a division of Platts. All of this oil flowing out of Texas and other shale regions could throw a wrench in OPEC's plans to bring the oversupplied oil markets into balance and the cartel's ability to negotiate more production cuts later this year. The EIA also cited changes to its forecasting model that better account for how U.S. rigs have become vastly more efficient. Those efficiency gains have been critical. Lower prices, better technology and improved balance sheets have allowed U.S. shale companies to do more with less. "Thanks to these advancements, we can still grow, even in this lower-price environment," said Essner. She cautioned that while the "amazing" improvements in technology and operations are sustainable, U.S. production could be limited if servicing and labor costs rise too quickly. There's good news for American drivers -- the EIA doesn't think oil prices will rise much above the current level of $53 a barrel. The agency predicted an average price of just $53.49 a barrel this year and $56.18 next year. "Nobody expects prices to revisit a triple-digit handle," said Essner. The oil industry could also get a boost from President Trump, who has promised to take a friendlier stance towards fossil fuels than former President Obama. While the EIA didn't specifically mention Trump's energy policy in its forecast, Trump has promised to unleash the American oil boom. The president has already taken some action by moving to cut EPA regulations and advance the stalled Keystone XL and Dakota Access Pipelines.